Brian Boru began life as the son of a minor regional king, but he ended it as the first High King of Ireland from outside the Uí Néill dynasty. 2014 marks the 1000th anniversary of his death, and a great many events and exhibitions are planned to commemorate the battle. Fin Dwyer, creator of the excellent Irish History Podcast, calls the Battle of Clontarf “the most-famous and most-misunderstood battle in Irish history.” It’s easy to see why. During the many centuries of rebellion and resentment against the English occupiers, the Battle of Clontarf was held up as a great example of the Irish throwing off their occupiers (in this reading, the sole enemy was the Vikings) — indeed, while I was at national school in the 1980’s it was very much the official line. (Witness High Frazier’s romantic depiction of the struggle above.) Modern historians have largely rejected this simplified interpretation. 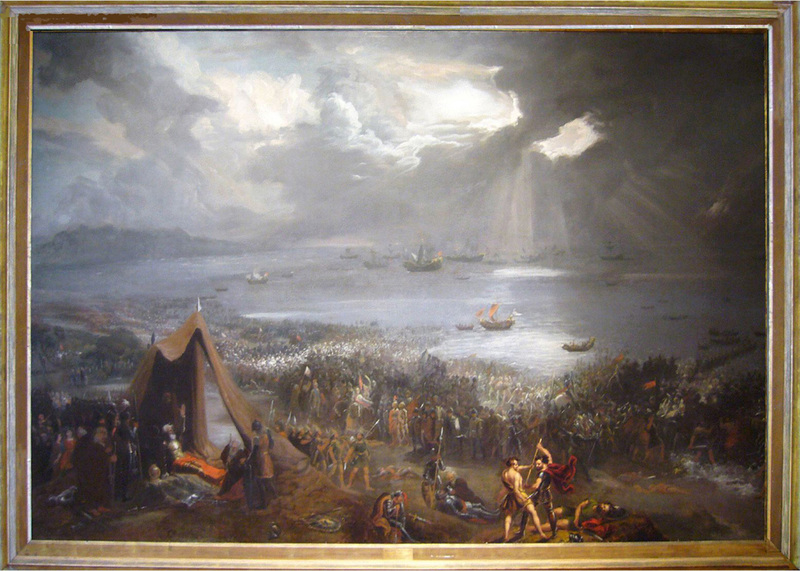 The Battle of Clontarf was fought to put down a rebellion against Brian’s authority, not expel invaders. Brian had established himself as High King in 1002. However, it would be overstating things to call him the undisputed High King, as the years from 1002 to 1014 were marked by almost constant warfare against rebellious kings, but most of the country accepted him. In 1012, Máel Morda mac Murchada, the king of Leinster, rebelled. He had allies among the Vikings who ruled Dublin, and initially had hopes of finding more among other dissatisfied Irish kings. He was disappointed, as these kings, who had been consistently on the losing side against Brian for two decades, decided to sit the conflict out, and he had to find allies overseas, largely among Viking mercenaries from England and the Isle of Man. But, Brian had his own Viking allies, from Limerick, Waterford, and Cork, so the battle certainly wasn’t about driving the Vikings out of Ireland. Brian brought his forces to Leinster and moved against Dublin, where Máel Morda’s Viking allies arrived on Palm Sunday in 1014. 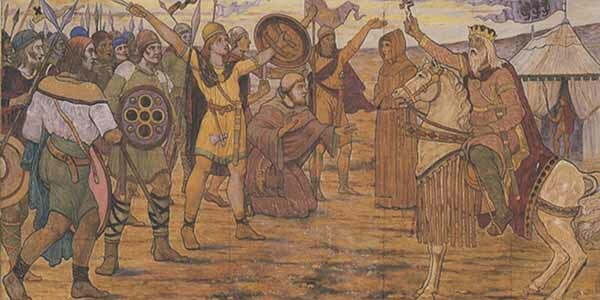 After Brian’s supposed ally, the previous High King, Máel Sechnaill mac Domnaill, withdrew his forces — possibly as the result of an argument — Brian found his forces roughly equal to Máel Morda’s. He sent messages for reinforcements, but they would not come in time. The battle itself lasted all day — probably an indication of the armies relative parity — and at the end, although Brian’s forces were victorious, the cost was incredibly high. Brian was killed, as well as his son, and many of the important chieftains of the Dal Cais, Brian’s tribe. Their deaths left a fatal power vacuum, and Máel Sechnaill, having sat the battle out and kept his army intact, stepped right back into the high kingship. 2014 marks 1000 years since the battle was fought, and the Irish tourism authorities are pulling out all the stops to commemorate this celebrated event in our history: one of the bloodiest battles fought in Ireland in the middle ages. There will be many events and exhibitions at important sites associated with Brian’s life: Killaloe in Co. Clare, where Brian’s rise began; Cashel in Co. Tipperary, the seat of the kings of Munster; Armagh in Northern Ireland, where Brian was buried and which he helped establish as the center of ecclesiastical power in Ireland; and at Clontarf, Co. Dublin, scene of his famous final battle. Brian Boru is one of the most-storied and mythologized characters in Irish history, and these 1000-year anniversary celebrations of the Battle of Clontarf are a great opportunity to understand the real facts behind Brian’s life and explore the fascinating history of those turbulent times.